Q. 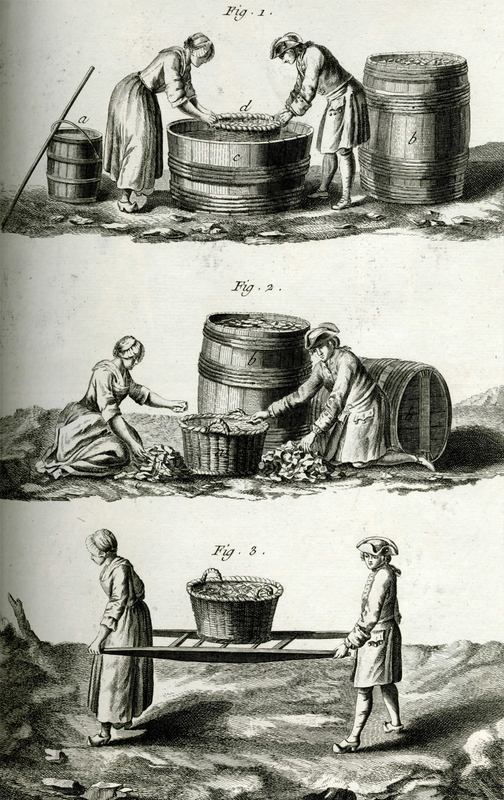 How were women employed in the glass making business in the 16th and 17th centuries? Image: Sorting and carrying cullet. In Denis Diderot, Recueil des planches sur les sciences, les arts libéraux, et les arts mechaniques :avec leur explication, v. 10, plate 16. Paris: Briasson, 1772. CGML 72339. Hello! Thank you for your question. According to Lucartha Kohler in her book Women Working in Glass, "In medieval glassmaking, women were usually restricted to auxiliary jobs such as sorting cullet for remelting and washing and cleaning the glass. In rare instances they were permitted on the blowing floor" (10). Kohler also discusses the impact of glass bead making on women's labor in the 13th century in Venice: "Many shops employed women who worked at home as both bead makers and bead stringers." She continues, "By the eighteenth century women were both lamp-bead artisans and bead stringers, but given the illegal nature of women's employment, it was difficult to know how many there were and if their work was limited to bead making" (11). Kohler notes the success of women in the area of glass painting, with women's names affiliated with the British Society of Master Glass Painters from the fourteenth century on: "These women not only did tracing and painting, but in some cases designed and executed panels for windows" (12). For information on women's work in glass manufacturing from the 18th century on, in addition to Kohler's book, you might be interested in a 2010 article written by now-retired Research and Reference Librarian Gail Bardhan in All About Glass on the Museum website: "Breaking the Glass Ceiling: Women Working with Glass." If you wish to borrow copies of library items, please contact your local library. The Rakow Research Library will lend designated books from its collection and will send copies of articles requested by other libraries. Your library can request items through the OCLC WorldShare Interlibrary Loan (ILL) system or by direct request through email at ill@cmog.org. For more information, please see our ILL policies and procedures on the Library website. Can you recommend sources of information on the early history of glass beadmaking?